Prepper audiobooks are a great way to get through a book and learn a few things without having to sit around. Physical books take precious time to sit down and read through and I always feel a little lazy reading a book since it feels like I am not being very productive. Audiobooks fix this, since I can work on my preps, mow the lawn, commute to work- all while listening to a book! Audiobooks used to be annoying; you had to have several CDs or many cassettes and records to swap out between chapters. You had to hang out at your sound system to listen to them, or save them for a road trip. This is no longer the case. You can fit virtually all the prepping audiobooks available onto your phone and listen to them hands-free doing anything you want. This makes them great for multi-taskers like myself. If you are enthusiastic about staying up to date on prepping- it is a no-brainer. There are plenty of ways to get your hands on audiobooks, but one of the most popular options and the one I use is Audible. It is an Amazon company that lets you subscribe and listen to audiobooks. They have a free trial that gives you two books for free. It’s definitely worth checking out- even if it’s just for the free books. 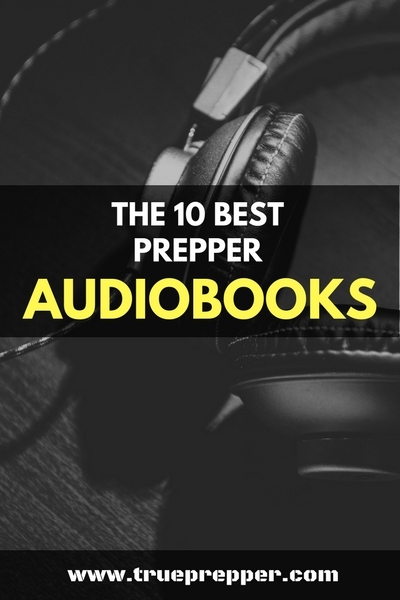 In the list of the best prepper audiobooks below, I’ll put the Audible link for each book and you can just sign up for the free trial if you are not already a member. 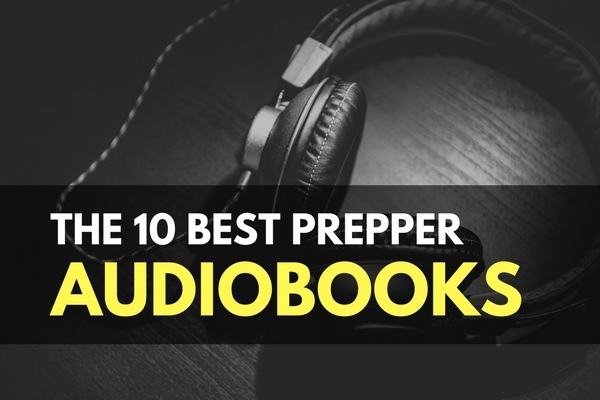 Here is our list of the ten best prepper audiobooks and where to download them. Realism is what Goodwin strives for, basing his dystopian fiction on a very possible financial meltdown. Although the method of the meltdown is certainly fiction, the grim aftermath could be a glimpse into the future. The book is a good listen at almost eight hours. Find it on Audible HERE. This book borderline glorifies an apocalyptic trek, but that doesn’t make it any less enjoyable. The protagonist has it relatively easy for someone enduring SHTF, but this allows the author to explore other concepts. The audiobook is a nice length at thirteen hours long. Find it on Audible HERE. Mykel Hawke is a well known survivalist and former Green Beret (obviously). He is featured on TV shows and has his own survival training company called Spec Ops Inc. He offers one of the longest books on the list at 15 and a half hours long. It is definitely wilderness survival focused, but any prepper can find useful information in this audiobook. Find it on Audible HERE. Courtley covers a wide span of survival, from improvised weapons all the way to pandemic survival. The result is a step-by-step guide that can help a beginning prepper or experience prepper looking to hone their skills. It is almost ten hours of content, so there is plenty to digest. Find it on Audible HERE. Winchester crafts a story on how disasters usually don’t occur when it is convenient. The protagonist finds himself in a pickle when an EMP cripples the country as he is thousands of miles from home and his prepping stash. The book is six and a half hours long and serves as a great warning about preparedness on the move. Find it on Audible HERE. This series is sparked by a nuclear attack on all of the port cities. We all know how devestating that could be to our infrastructure and society, and Bradford does a great job of showing how tensions escalate under pressure. It is a short four hour listen. Find it on Audible HERE. This is a basic rundown of what should be in a medical kit with ideas and skills that you need to know. It is a very short listen at a little over an hour. Find it on Audible HERE. Superpox-99 has wiped out the majority of the population in this popular fiction novel. Bradley details a true worst-case scenario right on the edge of impossible, but with a tone that has you feel as if you were there. If you are looking for something different, be sure to check it out. The audiobook lasts five and a half hours, but it seems like it goes by quicker. Find it on Audible HERE. Mr. Riddle can write an intense novel, as he demonstrates in this book about an outbreak originating in Kenya. It will keep you on the edge of your seat for all 19 hours. Find it on Audible HERE. This novel is set in my backyard- North Carolina and is a harrowing tale/warning of the consequences of an EMP detonation. The book has helped many get into prepping and is definitely a good listen. The run time is about 13 ½ hours- so it will last you a good while if you don’t binge it! Find it on Audible HERE. Staying informed is important but it is still hard to make time for. Audiobooks let you double up on time you are already doing other things. I like to listen on my commute, while doing yardwork, and sometimes even just relaxing. It never hurts to stay sharp and continue learning. Keep exploring, stay prepared, and be safe.